Get ready for a very special installment of Inner Moonlight at The Wild Detectives! Caitlin is pleased to be reading her poetry alongside her partner and frequent collaborator, Sebastian H. Paramo. A brief open mic will follow. Spiderweb Salon's monthly Happy Hour Workshop Series continues with a poetry workshop that will forever change how you approach the written word. Come learn with two prolific poets, teachers, organizers, and creators: Caitlin Pryor and Sebastian Paramo. These two will lead you on a wonderful exploration of words. $5 cover or VIP access for card-carrying Patreon members! Spiderweb Salon is hosting at a VERY RARE showcase in Dallas featuring an impressive group of writers, performers, musicians, dancers, artists, and talented friends from all over DFW in one showcase. Not only will we be featuring an eclectic collection of performances, but our host gallery will also be displaying work by Dallas-based artist Daniella Cruz. If you'd like the address or a formal invitation to this awesome private event, please send us your contact information at spiderwebsalon@gmail.com. Showcase featuring work by Brian Clifton, Caitlin Pryor & Sarah Ruth, Conor Wallace + Corbin Childs + Sam Cook, courtney marie, Elise Matthews, Jesse Porter, Lauren Belmore, Leah Tieger, Logen Cure, Mike Soto, Machele Johnson, Naomi Schiller, Paul Koneicki, Reverie Evolving, Sean Enfield + MORE TBA! Doors at 7, show starts at 8. BYOB. $5 suggested donation. Let's get weird together on the other side of I35! Oh, those good old angsty teenage years. Raging hormones, life-or-death love, and so. much. poetry. Thank goodness we're not there anymore. But, for one night only, Spiderweb Salon is leading an expedition to that once familiar place: the Planet of the Angst. Come join wordsmiths and music makers on the cozy patio of Wine Squared as they read and perform the angstiest of the work they made as teenagers. Let's celebrate our departure from the terrors of that planet while we acknowledge our debt to the art that got us through! Showcase curated by Bonnie Jo Stufflebeam. The show is FREE for Spiderweb Salon patreon subscribers or has a $5 suggested donation. This month, Sebastian and Courtney host the poets Trista Edwards, editor at Luna Luna and Till the Tide, an anthology of mermaid poetry; Caitlin Pryor, winner of the Littoral Press Poetry Broadside contest and Associate Poetry Editor at Pleiades; and Jacob Shores-Arguello, whose second collection of poems, Paraíso, was the inaugural winner of the Cantomundo Prize. Spiderweb Salon's very special Harvest Masquerade will showcase a beautiful bounty of collaboration & creativity: poetry, stories, music, art, zines, tricks, treats, and so much more! This will be our humble art collective's sixth (!) annual masquerade event, and the location is TOP SECRET unless you're in the know! (We sent out private, snail-mail invitations this month, but if you're itching to go and don't have a physical invite, contact us for info). Should you be one of our lucky attendees, here's a sneak peak of the incredible lineup of artists and performers who will be sharing with us on this fine fall evening: Axel Severs & Rae Inmon, Charlie Moore, Christopher David Taylor, Conor Wallace + Corbin Childs, Fatima-Ayan Malika Hirsi, Francesca Framer, Kelsey Cooley, Megan Storie, Nadia Wolnisty, Orion Centauri, Roy González, Sarah Friday, Sean Enfield, Taylor Denise Teachout, Walker Smart, PLUS visual art by McCall Mayhem Clark and Alex Stock! and a new comic release by Joe Duncan! and art for sale from Sarah Friday! and fresh baked treats from Caitlin Childs! AND SO MUCH MORE! Caitlin will read from her essay-in-progress: "Red Flag." ​Poetry Reading and Showcase Curation: Deep Ellum Lit Hop 2017! Deep Ellum Lit Hop is a well-read bar crawl experience going down in Deep Ellum, TX. Guests attending this FREE event are encouraged to wander between bookshops, art galleries, and bars to enjoy an eclectic collection of literary atmospheres. This one-day-only event, sponsored by Dallas literary nonprofit Wordspace, concentrates many of the incredible things happening in literary Dallas into a single evening. Reading series and collectives represented include Dallas Poetry Slam, Dark Moon Poetry & Arts, Verse & Rhythm, Lucha Dallas, Mad Swirl, Poets on X+, DaVerse Lounge, Spiderweb Salon, Pegasus Reading Series, Pandora's Box, and more! Caitlin curated and will host the Southern Mythologies showcase, featuring Greg Brownderville, Trista Edwards, Christopher Beard, Stevie Edwards, and Kim Nall. ​This Texas-themed exhibition involves the work of twelve photographers. Caitlin is one of twelve writers who will collaborate with these photographers and respond to their visual work through poetry. The photographs and writing will be on exhibit from May 11 through June 3 at Kettle Art Gallery in Deep Ellum. Zines of the included work will also be for sale. Other People's Poetry is proud to present the poetry of Frank O'Hara. We will be reading the complete contents of the great New York School poet's LUNCH POEMS, plus a selection drawn from his posthumously issued collected works. Readers: Richard Bailey / Dan Collins / Imana Cordova / Sean Enfield / Tom Farris / Alan Gann / Serena Howe / Lauren Felice Ayres Jarocki / Courtney Marie / Gabe Mamola / Misty Amber Moore / Craig Nydick / Johnny Olsen / Joel Page / Patrick Peterson-Carroll / Caitlin Pryor / Walker Smart / Mike Soto / David Eric Tomlinson. Copies of O'Hara's LUNCH POEMS will be available for purchase at the event, thanks to our sponsor and host Deep Vellum Books. 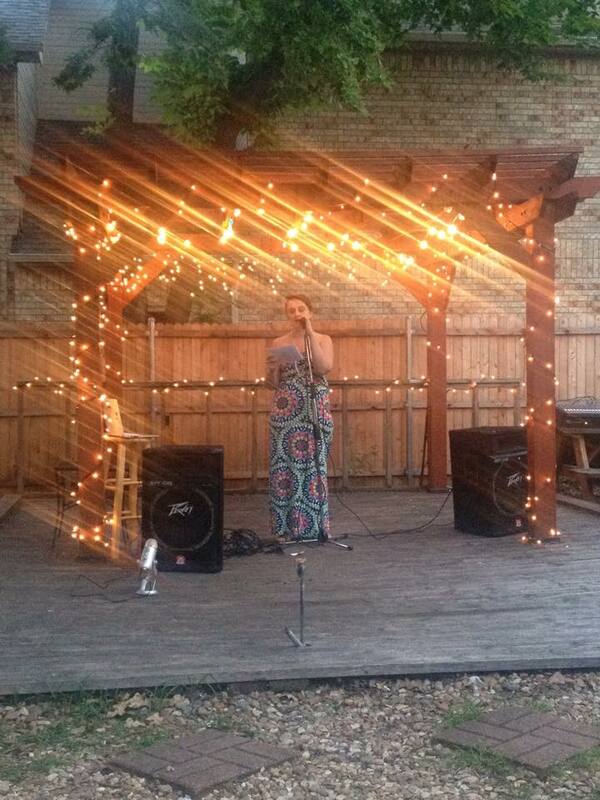 Poetry Reading: Spiderweb Salon Celebrates National Poetry Month! Over the month of April, Spiderweb Salon will be showcasing excellent poetry by some of the best creative minds in the Denton/NTX community. The Goal: to celebrate at least one local writer for every day of the month throughout National Poetry Month. On April 22, Caitlin will read for Spiderweb Salon at their POETRY PARTY & special showcase at Wine Squared in Denton. Come join us as we bring the work of local poets to life! ​This Valentine’s Day, for one magical night only, Spiderweb Salon is teaming up with The Wild Detectives to present a very special collection of collaborative performances by artists from all over the DFW area. We are so excited to host this event in one of our favorite venues around! Bring yourself, your sweetheart(s), your loved ones, and friends to an evening of creativity that won’t soon be forgotten. Every performance will feature brand-new work tenderly crafted by people who love each other. Featuring performances by Axel Severs & Bess Whitby; Sebastián Hasani Páramo & Caitlin Pryor; Fatima-Ayan Malika Hirsi & Nick Long; Lauren Belmore & Alex Carland; Leah Jones & Jacob Greenan; Edyka Chilomé & courtney marie; Machele Jnson & Emilie Anne S; Conor Wallace & Walker Smart; Matthew Long & Tara Linn Hunter; Elana Nelson & Randy Johnson; Derek Tusing & Christopher Hughes; and Thoele Sarradet. The Magnificent Seven is a reading hosted by Pleiades, AGNI, American Literary Review, Boulevard, Cream City Review, Gulf Coast, and Poemoftheweek.org. Come on down to Bayou and help us celebrate the Magnificent Seven at a reading featuring journal contributors! Meet us upstairs for a drink at the bar in the company of friends, where journals will be sold at discounted prices. Readers include Chen Chen, Alice Elliott Dark, Matt Donovan, David Keplinger, Shara McCallum, Gregory Pardlo, Caitlin Pryor, Maggie Smith, and Ryo Yamaguchi. Come to Deep Vellum Books, located in the heart of Deep Ellum, for an evening with a trio of poets. Reading alongside Jenny Molberg and Andrew McFadyen-Ketchum, Caitlin will read alongside her friend and collaborator Jenny Molberg, who will read from her debut collection, Marvels of the Invisible.